The eagerly awaited Super Bowl ad for BlackBerry was revealed during the game, and it showed that BlackBerry decided to go with humor instead of technology. The Canadian based tech company said that it wanted an ad that everyone would remember the next day when they were talking about the game. BlackBerry said that it wanted to show everyone that "BlackBerry is back," said CMO Frank Boulben. The point of the ad is that there are so many things that BlackBerry 10 can do, it is easier to show what it can't do...like set you on fire while you are walkimg, or turn a jack-knifing fuel truck into a large number of harmless orange balls. Some of the scenes from the ad had already been teased by BlackBerry. We have a real treat for you tonight. First, we have the actual ad for you to watch, and then we have some comments on the commercial from BlackBerry's CMO Frank Boulben. Whether you caught the ad when it was aired, or have yet to see it, click on the video below to watch it. Based on the official comments from BlackBerry, we would expect future ads to show off the new OS and the new phones. I thought iPad mini ad is the lamest? That has to be a RIM marketing ploy... There were waaaaaayyyyy better comercials than that one. I haven't used the word lamest have I? You obliviously didnt see the Tide ad. Best ad of the night. They are saying that the new Blackberry can do so much that it is not possible for us to demonstrate everything in 30 seconds. So, instead we will show you what it can't do thereby implying it does almost anything. Funny stuff let hope the OS isn't as laughable. 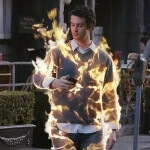 Its hard to compete against the commercials following blackberry. You wrote "turns truck into harmless orange balls" they were rubber ducks, not balls. I even posted in the last BB SB ad article it was rubber ducks...lol. I had nothing else to do, the power went out. Wow, that was seriously a waste of roughly 3.8 million dollars. I hope this device sells well for them but I doubt that commercial will be the reason. I thought it was clever. If anything...it will have you guessing until the very end WTH its about. That type of marketing worked for that Cloverfield movie. it was a good idea but poorly executed. BB needed to really stand out and failed with this ad. Pretty much everyone I was watching the superbowl with was just like huh? Then proceeded to go back to using their iphones. Uh...it wasnt a tech saavy commercial. IMO it did attract the casual consumer...by being funny, colorful. I think some of yall are missing what this ad could do. It was a SB ad. Majority of SB ads are funny. The SB ads this year were probably the worse in about 10 years. This might be one of the few ads that stood out this year during the SB. It was funny, and colorful. It didnt explain what it was about until the very end. That appeals to people's curiosity. I cant believe we all saw the same commercial....lol. Oh well. She was there in a way.....she was in the phone. Maybe she will be in a future one.